Our team is made up of the highly qualified dog training experts that are passionate about their furry friends! When you bring your best friend to Splash Your Pup, you can rest assured they’re in good hands. 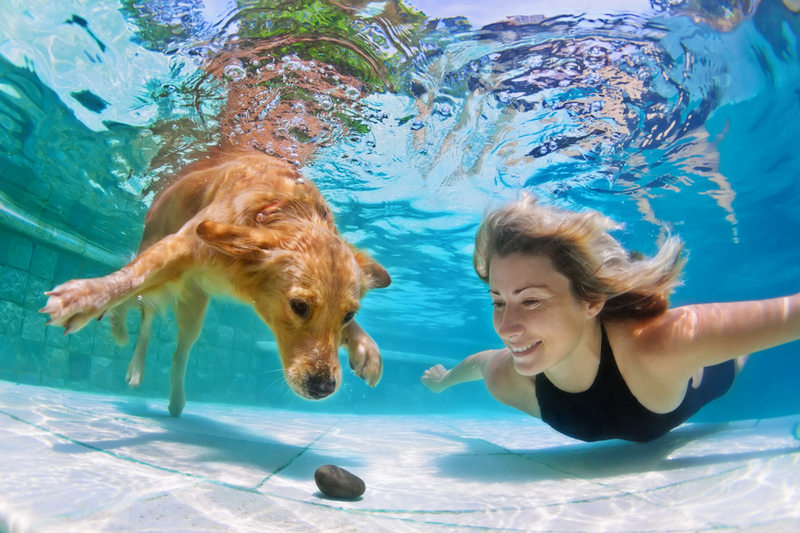 All employees at Splash Your Pup are certified in pet first aid by the Pet Professional Guild and hold various titles and awards in dock diving, rally obedience, frisbee, and agility. In addition to professional obedience and dock diving trainers, our facility also boasts a certified canine massage therapist, as well as a FitPaws instructor specializing in canine fitness and physical therapy. After making the difficult decision of retiring from the horse industry Danielle decided to go back to school to finish her Bachelor's degree at the University of Texas at Arlington. There she graduated with honors after completing her senior thesis, which was based on the behavioral development and effects of stress on canines. The next step in Danielle's professional dog training career was training group classes where she worked with 500 dogs and handlers. Danielle also spent two years as a Veterinarian Assistant, which gave her a better understanding of the medical-related issues in relation to behavioral problems. Since living in Ohio, Danielle has helped countless dogs and handlers with behavioral issues. Many of the families she has worked with did not feel comfortable leaving the house with their dog or having people over. Now many of them are thriving, healthy, and living a happy, furry life. Danielle has also spent many years competing with herding breeds around the country for both competition, entertainment, and charity events. She is the proud owner of a pack of Border Collies, Brittany Spaniel, Papillion, and Dutch Shepherd. All are members of the family that happen to all be accomplished performers or vital member of the geese management business. She is also an active member of the rescue community where she helps other high drive dogs in need. Kathleen O'Neill - Hydromassage therapist, massage therapist. Kathleen is a long time dog owner who has failed at retried and received multiple certifications in helping dogs recover from injuries or become better athletes through proper cross training. She has an Australian Shepherd and Border Collie and compete in frisbee events and dock diving. Kathleen's main focus is to help dogs learn how to swim, recover for surgery, and help condition sport dog to the best of their abilities. Kathleen can create a plan to help your dog with massage, hydromassage, or physical therapy. Dock captain extraordinaire, Cheri Davis, is the proud mom of 3 amazing black Labradors (Murphy, Mila, and Abracadabra), all of whom have successfully competed and earned titles in various dock diving and agility events throughout the country. Abracadabra is certified in pet therapy through Miami Valley Pet Therapy association, and has earned her AKC TD therapy dog title. Murphy, has trained in agility, and rally obedience. He also recently completed his Novice Trick title. Mila is the baby of the group. She competes in both the Ultimate Air Dog and North American Dock Diving venues. She has completed her AKC DN novice dock diving title and qualified for the Eukanuba AKC National invitational in December of 2015. Mila completed five jumps between 10’ and 14’11” to complete her UJJ, UKC United Junior Jumping title. She is also currently training in agility. With over twelve years of experience teaching obedience and agility classes, Cheri has successfully coached her family of labs as they competed in the Ultimate Air Dog and North American Dock Diving venues. In addition to agility and diving training, Cheri has also been involved with the Miami Valley Pet Therapy Association for thirteen years, where she worked as Education Director, an instructor, and evaluator. Greg Wagner is a certified American Kennel Club Canine Good Citizen Evaluator, S.T.A.R. Puppy Evaluator, and AKC, CGC and APDT certified. Greg got his start in the property management field, where he would use his Border Collies to humanely deter geese from the properties he managed. When his company downsized, Greg decided to start his own company, and is now the proud owner and operator of Stalk and Awe Geese Management, LLC, a successful geese management company that serves Dayton and the surrounding areas. Greg specializes in the puppy classes, where his patience and understanding of how to create a bond between handler and dog makes him ideal for this position. Greg loves to find new and fun ways to encourage young dogs and challenge handlers, and is also currently working on his certification from C.A.T.C.H.